I seem to have gotten myself in another spinning bind. Meaning, I’ve got two active projects, both which are being spun into laceweight singles. So the spinning is going super slow, making me feel like nothing is getting accomplished. Meanwhile, I keep dreaming of my fiber stash and wanting to start something new. Compounding this issue is the fact that I feel I don’t have anything new or interesting to post on the blog. Then I really start dreaming of pulling out something new! I remembered, I had started something new awhile back and I never got a picture of it. And it isn’t quite laceweight singles. I bought these lovely corgi hill lush batts awhile back, being drawn to their rich color. I started spinning them on my little golding bog oak spindle, but that spindle is best used for something lighter and it wasn’t going that well. I balled up what was on the spindle the other day, set it all aside, and forgot about it. 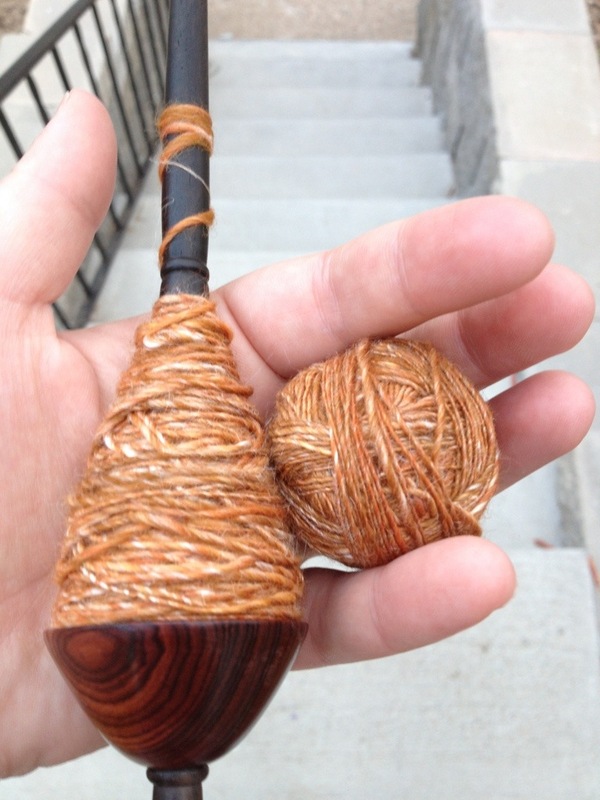 Last night, realizing I really needed to be able to work on something besides plain brown saxon wool, I remembered the lush batts, pulled them out, and started spinning the remainder on my neal brand tibetan. It went much better than the bog oak spindle. I didn’t get much done as by the time I figured all this out it was getting late. But it was just what I needed. 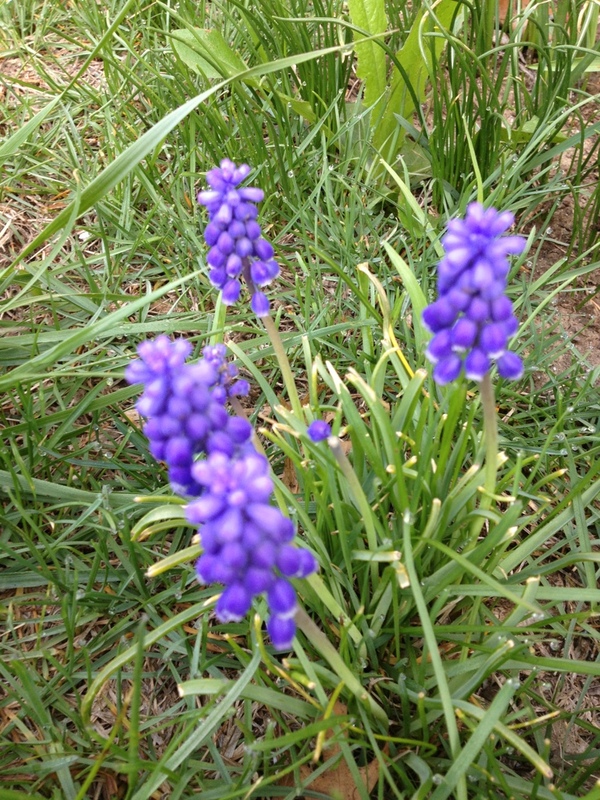 Before I get started, do let me indulge in one more spring picture. 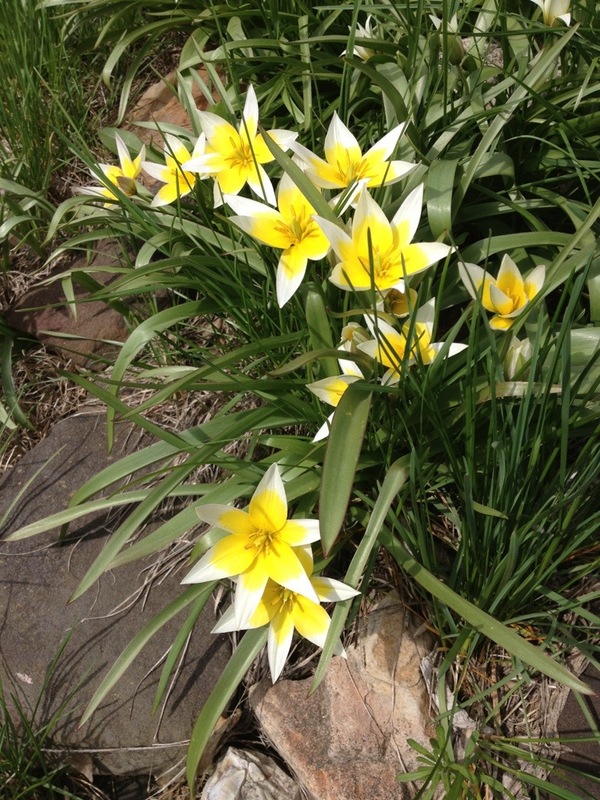 If you know what this flower is, please tell me. I do not have a clue! So the discussion on silk hankies the other day triggered a blog post. I’ve been thinking a ton about what we learn, how we learn it, and what we then believe is correct or incorrect. Now, for the record, I am a self taught spinner. I bought a wheel in 2007. Knowing few spinners and being an introvert and enjoying the process of hands on learning combined with research, I absorbed as much knowledge as I could and applied it. While there were a few other spinners in my area, many of them were at my level of knowledge or were out there giving incorrect information. I remember asking someone who had been a spinner for years about my spinning. I asked something about tension and she said “Tension doesn’t matter.” This I knew to be incorrect, and it really turned me off when it came to learning from other local spinners. When I started spinning there was a trend going around that basically said that you had to wash and finish your yarn, and then hang a weight on it to get it to hang balanced. Using a bit of logic, this didn’t make sense to me. If my yarn is balanced, shouldn’t it hang straight without a weight? Why was a weight important. And indeed, having done a bit more research on the subject I realized that while some people do weight their yarn while it is drying it is not necessary, and also doesn’t give you a good idea of how the yarn will perform in reality. It also can mask problems, making a yarn that is quite unbalanced look to be balanced. And yet, for awhile, that trend persisted and most of the blogs on spinning would have some mention at some point about weighted yarn. In fact, there’s a possibility you’d find references to weighted yarn in my blog too, as I know I did it once or twice before concluding it wasn’t necessary. At that time, silk hankies were kind of a thing. A thing new spinners did. In fact, there was a knitty.com article about it. Even just reading the opening paragraphs it shows how it was the norm to think beginner spindle spinning was associate with silk hankies. Of course, now that I look at it, that article was written in 2005. And in internet fad terms, that was a very very long time ago. Now the trend is thwacking yarns. It is all over the place. Do you thwack? Why aren’t you thwacking? You aren’t finished unless you’ve washed and thwacked! I say it often too, in the sense that a new spinner sometimes pulls plied yarn off the wheel and calls it done. But the amount a yarn will change after a wash, even without a good thwack, is considerable. The amount of twist you’ve got in your yarn changes, settles, relaxes, and becomes balanced. Or, sometimes it becomes underspun. So, as a more experienced spinner, it is easier to tell someone “What you want to do next is abuse the yarn a bit, wash it, then thwack it, then hang it to dry.” Because that? That is easier, far easier, than trying to get into the nuances of when it is good to thwack a yarn, when it is better to just do some wrist snapping, and when you might want to be super gentle with your resulting yarn. I do not consider myself an expert spinner. I’ve only got 5 or so years under my belt. Some of that has been intensive and I do think I’ve been eager to learn and do as much research as possible. But, as a self taught spinner, I am positive I’ve picked up some bad habits along the way as well. I try to be mindful of this. I am mindful that I’ve never taken a spinning lesson from a professional. I try to be careful who I pull my knowledge from. I try to avoid the self avowed “spinning experts” and stick to the ones who have years of experience, books, classes, and are actively being asked to provide workshops all over the US. I follow what they say and teach and avoid blindly believing the latest trend. We live in a very interesting age. An age where you can learn just about anything on the internet. You want to learn to put a bike together? Hop on youtube and see what you can find. You want to learn to spin? There are so many videos for that. The trouble is, what you are watching may be someone with little experience telling you what they’ve learned, which isn’t even a tiny fraction of the whole. And they may present it as fact, or the only way. Just speaking in an authoritative tone doesn’t make one an expert. This is dangerous, and I believe that these are what cause trends. Self taught spinners saying “I learned to do it this way.” The new spinner they’ve taught then tells the next person “This is how you do it.” That person goes on to teach the next person and says “This is the only way to do this.” and a glorified game of “telephone” has taken place. The internet is also a funny thing, as it is polite to only “be nice.” And criticism or correction isn’t seen as “nice.” So that person on youtube who speaks in an authoritative tone about something she’s learned 2 weeks ago deletes “not nice” comments correcting misinformation and then a new spinner never even gets the chance to realize the information is patently incorrect. Here is the point where I have to acknowledge my own preferences. Can you spin the trends and be happy? Of course you can. 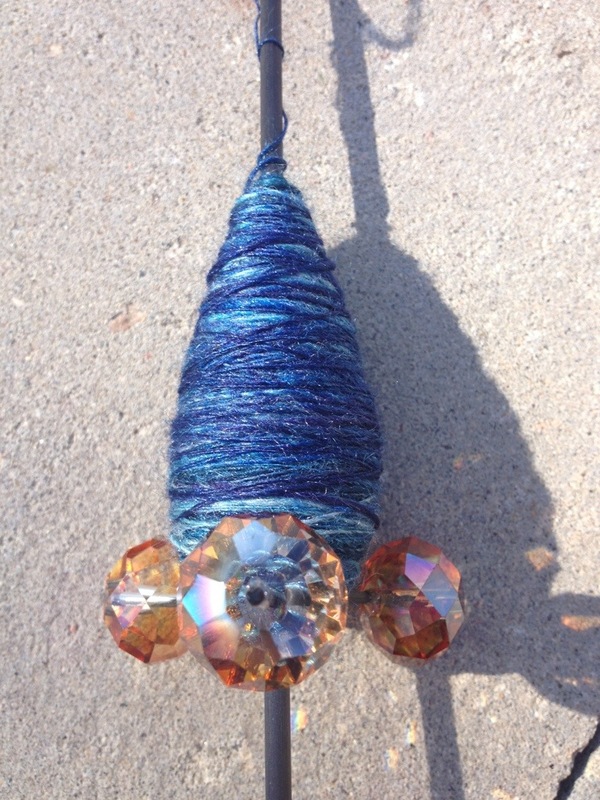 Can you spin yarn and not worry much about the why and wherefore? Sure! So really, if that is what you are looking for in your spinning, ignore this post. I am ok with that. However, if you are a self taught spinner like I am, and so many others out there, just be cognizant of this. When you want to learn more, do more, or you have a yarn result you’ve tried to change but cannot, it may be time to walk away from the latest trend and immerse ourselves in the experts, be it book form, video form, or in a professional class. And be careful of the authoritative statements, or the statements that only allow for one version of the many ways to do things. This, being as much a reminder to myself as anyone else! What spinning myths have you encountered or fallen victim to? I’ve gotten so little crafting done this weekend. And really, that is because this weekend has been the first truly spring like weekend. I’ve put 60 miles on my bike over the past few days and I plan to add another 30 or so to that today. It has been necessary for my disposition to be on the bike and soaking in the sun and sights of new growth. Crafting will just have to wait. 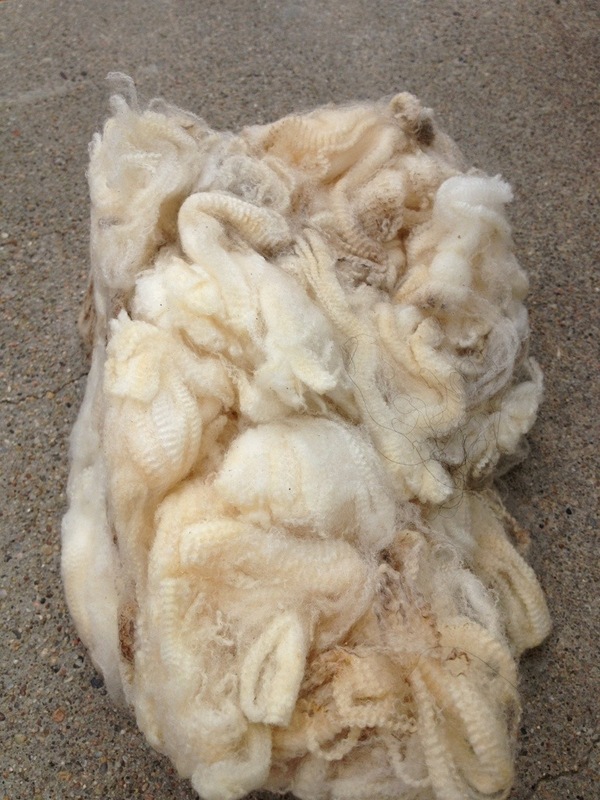 From my Between Ewe and Me fiber club shipment, shetland fleece. I love how this has two distinct colors. This is, as far as I know, my last fiber club fiber, as I don’t see a new club up and running right now. Then there are the 2 samples I washed recently. I actually washed the border leicester, decided it wasn’t quite clean enough, let it soak a few days and washed again. The water ran clear and I do not believe that the soak took any more dirt out than had happened in the initial wash. I do believe anything else will have to be flick carded out. 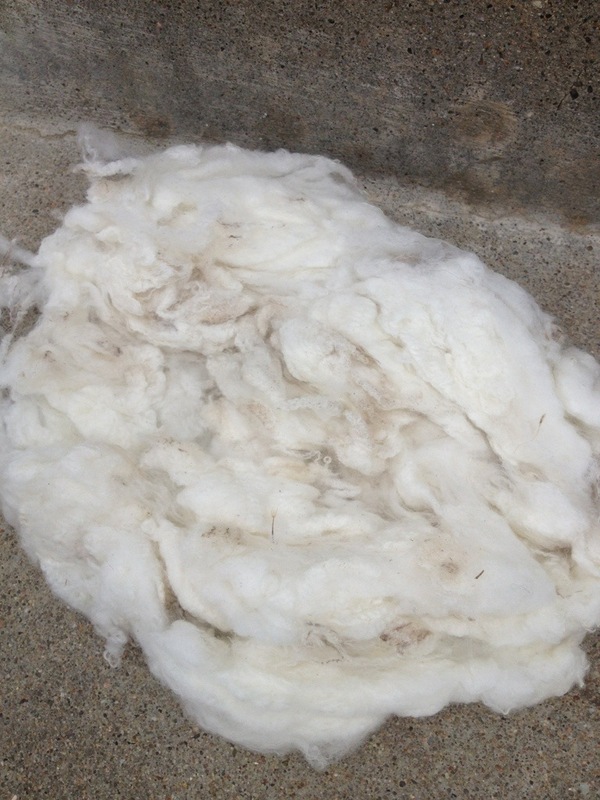 Fleece washing is so odd, I look at most fleece and don’t figure it is particularly dirty. And then….once washed I can finally see just how dirty it was. 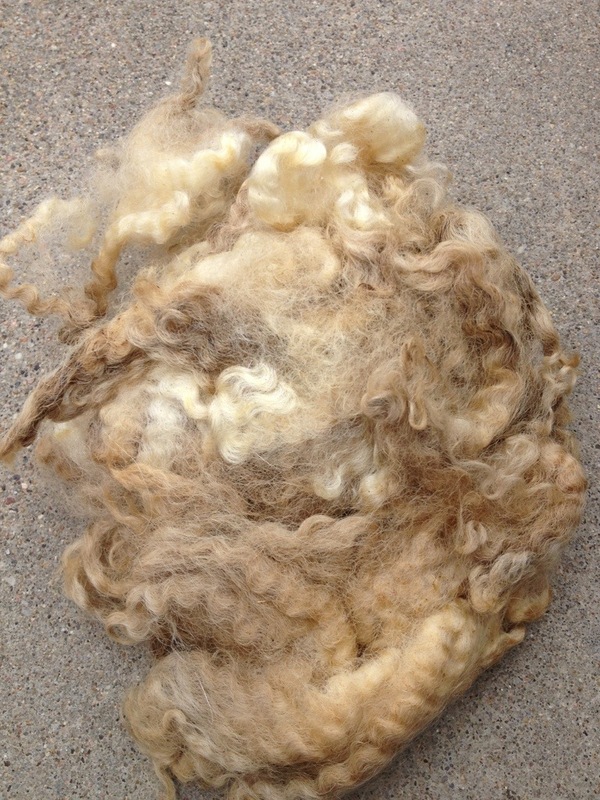 I have more samples floating around, Racka, Shetland and Navajo Churro. Maybe I will get around to that this weekend. 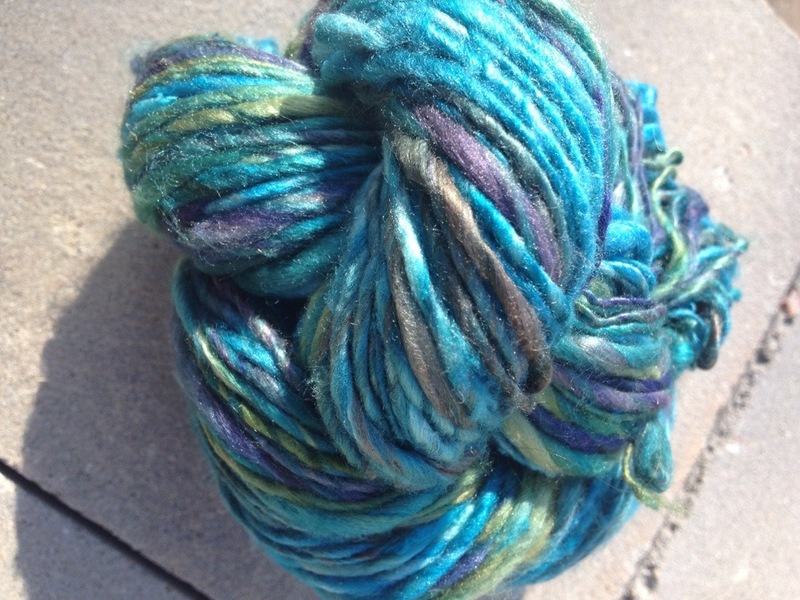 I also have a pound of Wenslydale waiting to be washed, about 8 oz. of CVM Romeldale, and more Corriedale. I don’t really struggle with castonitis. Not anymore. I don’t do enough knitting to struggle with it. In fact, I’d say I have finishitupitis if I’ve got anything at all. I don’t do enough knitting and because of that, nothing gets finished fast enough for me to want to cast on new things. I am learning to be very zen about that. Even going so far as to prolong projects for added enjoyment. Or knitting on something not because it will be done soon and I can wear it, but because I enjoy the feel or look of the yarn itself. That being said, all the angst, anxiety, and studiousness I used to put into knitting projects goes into my spinning now. I want to start all the fiber, I want to spin and finish things daily. I want even the thinnest spun yarns to go super fast. I want to spin in my spare moments and when I don’t get to, I feel like I’ve failed. Seriously, this is just how I used to feel about knitting. It is a drive to complete that is so unnecessary and yet seems to just be a part of me. In all honesty, this is a drive I’ve seen in myself when it comes to cycling too. I am so focused on going farther, faster, or getting up that one last hill that I rarely look up, look around, an enjoy the view. That’s a bit sad. While I bike for me and no one else, I should also remember that I can view it as an enjoyable experience, looking at the various sights around me and slowing down just a bit. I do believe that needs to be my goal in both cycling and spinning this year. Settle down, slow down, take a deep breath, enjoy what I am doing, enjoy the view, and remember that no one needs me to get there any faster than I do. I started some JulieSpins Merino Silk. The colors are so rich and gorgeous that even though they have no sparkly bits added, the silk seems to make it sparkle on its own. And on my Amber Trindle SST, it looks even more glorious, the amber crystals being a lovely contrast to the rich blue fiber. I am spinning this quite thin and enjoying every moment of it. Which means while it has been on the spindle for awhile now, I am taking it slow and so I haven’t bothered to photograph it until now. I am also enjoying my trindle SST. I know I’ve mentioned it before, but this spindle style keeps growing on me, proving that my spindle likes and dislikes are fluid. Now if only I could get a good handle on my Russian spindle! I finally finished Mawata gradient. I do believe I accomplished the goal of spinning them thick this time. 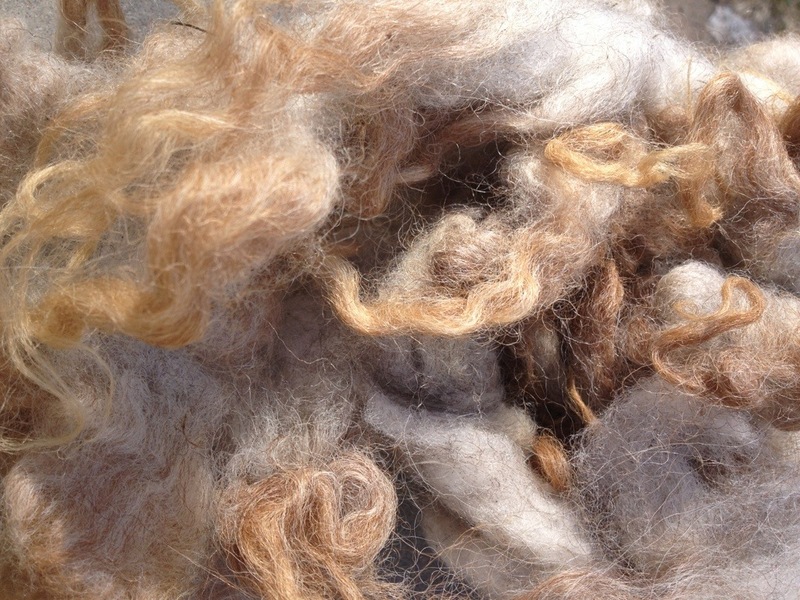 They are, of course, rather thick and thin but not thin like the ones I spun and plied ages ago on the wheel. I left them as singles in order to make sure I had as much yarn as possible out of them. 120 yards. They are very soft and shiny and no, I have no clue what I’ll do with them. “I just wanted to say a word about spinning silk. Silk hankie spinning is very very different from silk spinning. With silk hankies, all the little fibers are in disarray in the hankie and they kind of cling to each other, making it a pretty easy spinning experience. That is why I use it to teach spindle spinning, as it gives the idea of drafting before you get to the hard stuff. However, when spinning silk roving (or top, or sliver) all the silk fibers are aligned perfectly and that stuff is very slick and slippery. It acts differently than silk hankies. Then again, I always say that there is no particular fiber that is hard to spin, just different preferences among people. So, try it all and decide for yourself what you enjoy spinning, don’t say “That’s too hard, I should save that for later.” When I was a new spinner, I found silk blends the easiest to spin. 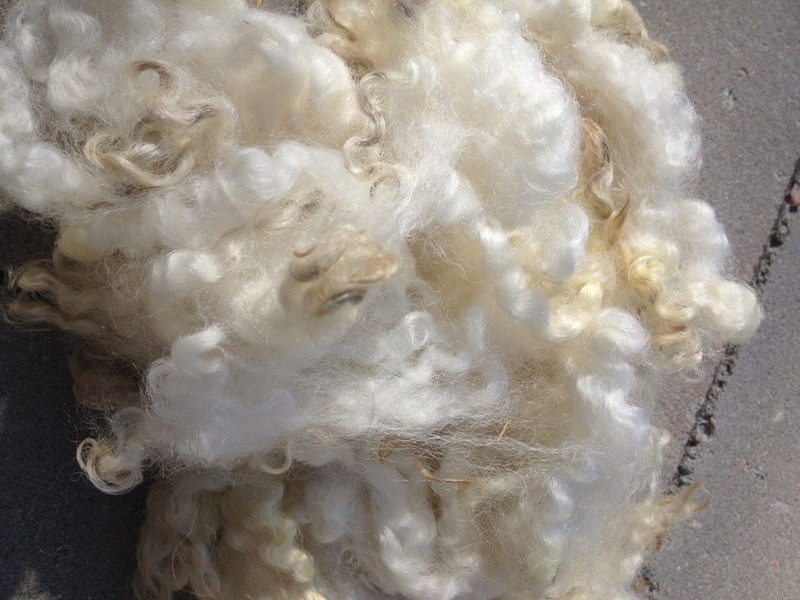 Merino/silk, BFL/Silk, if it had silk in it, I could spin it finer, faster, and more even than anything else I encountered. If you enjoy the silk hankies and are searching for more, they are also often listed under their technical name, mawata. Silk caps (or bells) is another prep you can look for, as it also gives a similar grabby silk experience. That being said, I am getting the impression that most people think that silk hankies are not for beginners. I beg to differ. In fact, in teaching my friend Marja how to spin, they were the second fiber I had her try, the first being Kauni pre yarn. Because the drafting happens prior to spinning, they give the new spinner the opportunity to learn to draft without having to handle the spindle at the same time. They were also one of the first things I was told to try if I was going to try a spindle. I am quite curious, for the spinners out there, were you told silk hankies were something to try early on, or something to avoid? 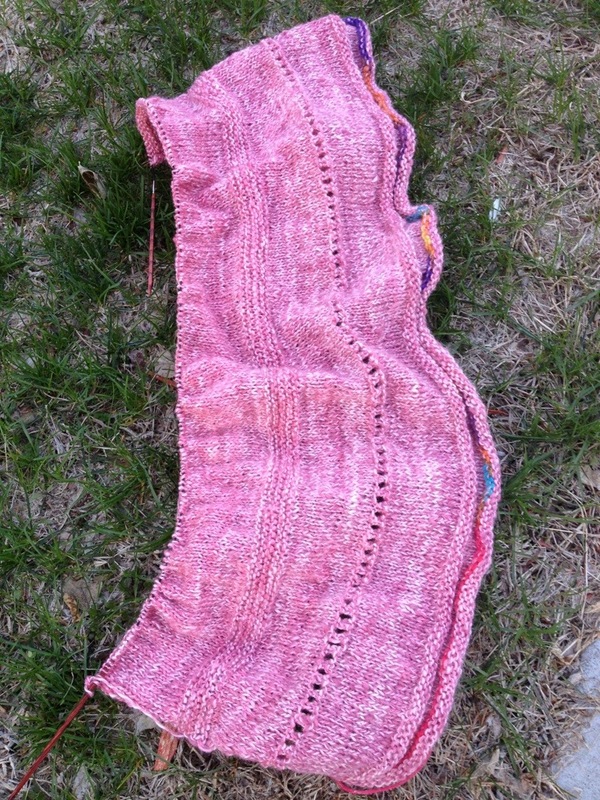 Awhile back I had a braid of UGLY dyed merino. I dyed it myself, so no excuses. Anyone who dyes knows that sometimes things just don’t work as expected. I also had a braid of tussah silk I just wasn’t interested in, colorwise. I blended them. And together they were so much prettier than on their own. Then I spun the batts, and plied them with the remainder of the silk. Oh how I loved that yarn, the color, the texture, the softness, and the transformation. However, I wanted something simple due to the textured yarn, and something that would be next to the skin, considering the extreme softness of the yarn. Enter my current cowl obsession. I chose the Muji Painting cowl because of its extreme simplicity. I figured that any texture in the yarn would be best served that way. However, it is a ton of stockinette. Not that I am upset about it, this seems to be all my brain is capable of knitting lately. I am throwing in details when the stockinette gets too boring though, so it will have a bit more detail than the pattern indicates.